The 2013 SRM report is now out and shows that SRM leaders are twice as likely to be receiving financial benefits of 8% or more. They are also twice as likely to be receiving customer of choice type benefits such as supplier innovations, access to best supplier resource, and joint product or service development. Fill in your details below to read the executive summary and request a copy of the report. 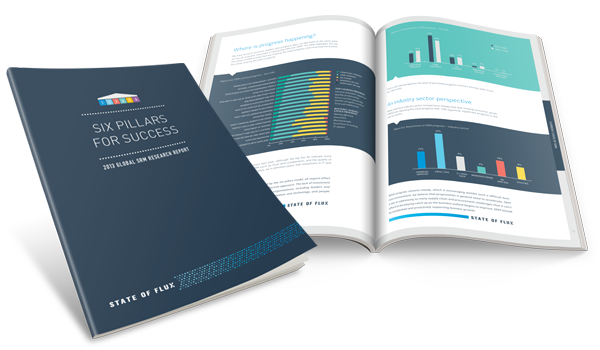 This year is the fifth consecutive year State of Flux has published this global research report, which draws responses from 425 global organisations. Once again, for the second year running, the report includes perspectives from the sell side on how SRM is being received by suppliers. A new element introduced this year is the SRM Index which will enable companies to measure and report on progress. There is a wealth of data, analysis and opinion on these and other topics in the report; alongside revealing case studies from some of the world’s leading companies. Please contact us on +44 (0)2078 420 600 or email us at enquiries@stateofflux.co.uk if you would like to participate in our 2014 research, obtain your SRM Index score and receive a free copy of the 2014 report.